This tutorial is about power chords, one of the foundations of rock music. It’s a must-know for any beginner in this music style! Hi everyone and welcome to this lesson about power chords. These chords are widely used in rock (and all its derivatives), but they can also be found in many other styles. We will see here all the basics that beginners need to learn in order to practice this technique properly. We will split this lesson in three sections. The first one will focus on the main position for power chords, the position you will come across in 99% of the time. We will also explain which fingers should be used, and we’ll mention the theory behind these power chords. In the second part, we will see everything you need to know so that you can play these chords and sequence them correctly, while adding a few dead notes. Finally, in the third part, we will deal with other positions, much rarer, but that you may still come across. This last part is therefore optional and it is only there for the curious who would like to expand a little on the possibilities these chords can offer. The power chord is a type of chord that’s found a lot in rock music. The preferred instrument for power chords is mainly the electric guitar, but power chords can also be used on acoustic guitar, in just about any musical style. 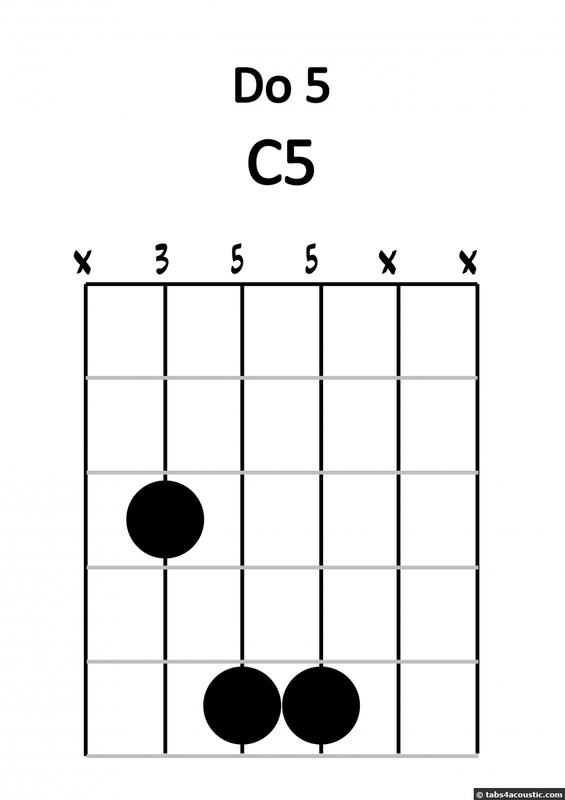 Writing a power chord on a chart will look like this: E5. A capital letter that gives us the root note (as for any chord), followed by a "5" to indicate that it is a power chord. 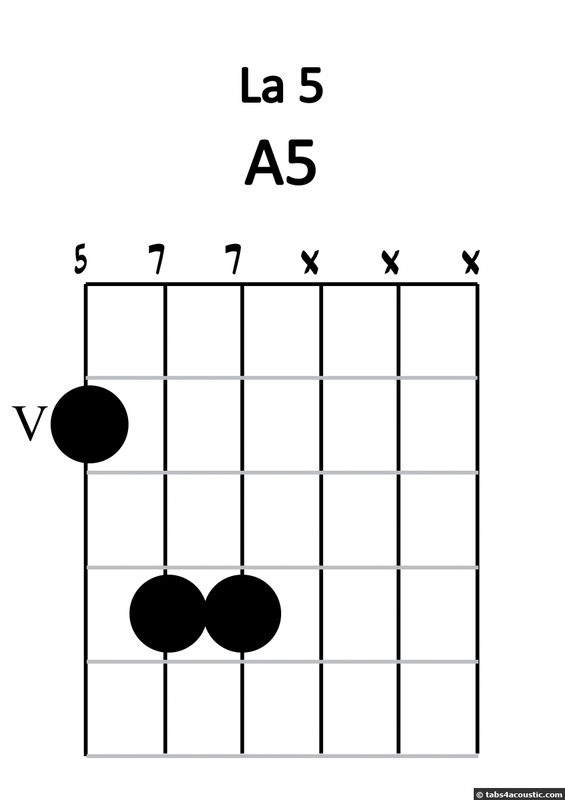 So, when considering E5, it means it’s a power chord in E. When considering Ab5, it will be a power chord in A flat. These chords have the advantage of being shiftable, like barre chords (but in a simpler way). We recommend you previously have a look at the tutorial on how barre chords are built in order to understand the principle of chords being shiftable. Those who already master this concept will be comfortable with the rest of the tutorial; as for the others, don’t worry if you don’t fully understand the following paragraphs, as their content is optional when playing power chords. Note that there are only three strings to fret, and that high-E, B and G strings must be muted. 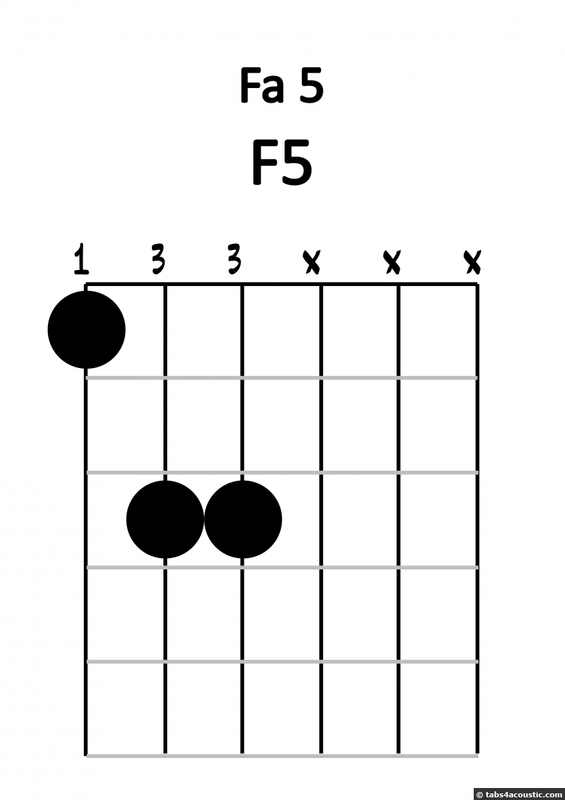 For those who know a bit about harmony, you will find that the lowest string (the Lower-E string) is played on the first fret, which gives us the note F. Therefore, this chord is a power chord in F, which will be noted as F5. The index ends up being on fret 5, the other two fingers are on fret 7, and now that the root note is a A, so we now have an A5 power chord. It also works on the A string! We do have the same position, but with a C as the root note, which gives us a power chord in C, i.e. a C5. However, watch out: this position only works if the root is on the (low) E string, or on the A string. If the root note is set up on other strings, you will have to use other positions, which we’ll mention in the third section. It is possible to play the power chords with a slightly different position: by playing only the two lowest strings on the position, instead of playing the three of them. Therefore, if we place the index on the 3rd fret of the lower E string, instead of playing 355xxx, we will only play 35xxxx. It will still be the same power chord, it will just sound slightly different. There is not really a finger placement that’s better over the other, it will depend on the context of what is being played beforehand and afterwards, as well as on your own preferences. Try them and choose the one(s) you prefer! To close this first part, we are going to give some details about the theory underlying power chords. For those who do not like theory, this part is optional so feel free to skip it if you’re not interested. A power chord is actually made up of two notes only: a root note and a perfect fifth. Some of you may be surprised, because a chord is normally made up of at least three notes. Yep, the power chord is not really a chord, it's just a perfect fifth interval. However, as they are used as chords, they are inaccurately referred to as such, so we’ll keep on calling them power chords. The position is quite simple to figure out: you find the root note on the lowest string, the next string has the perfect fifth, and the third string has the root note again, but two octaves higher. This is why the third string is optional: if you only play the first two strings, you still have the root note and the perfect fifth. To sum up the position for you to remember, you just have to place the index finger on the E string or the A string, then place the two other fingers on the two highest strings, spaced two frets down. This position can be shifted across the fretboard in order to play the required root note. The third note is always optional. Don’t forget that the other strings are muted, and it will be all good! The rest of the text will be available very soon. In the meantime, check out the video!